SCSI and USB are both supported. Accepts all major credit cards... and the likes. 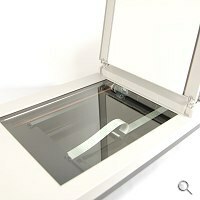 Flatbed scanning is also available. 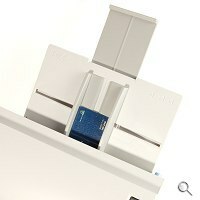 While Fujitsu is a brand that many have come to associate with high quality premium notebooks and notebook hard disk drives, general consumers at large would probably be intrigued at the very mention of highly specialized workgroup scanners bearing the Fujitsu badge. 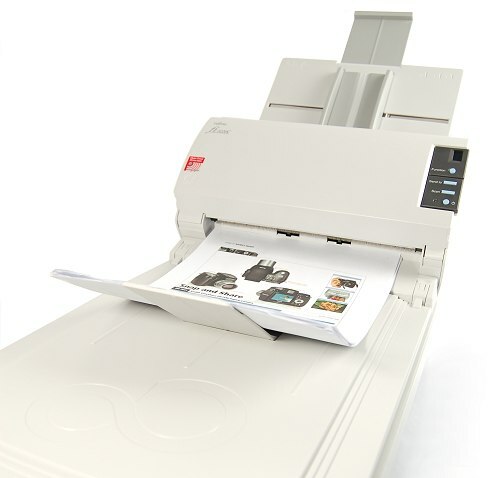 The truth however is that Fujitsu is no stranger to corporate solutions and the new fi-5220C image scanner with us is actually an improved model from the older fi-4220C, featuring higher scanning speeds, mixed batch scanning and embossed card scanning. 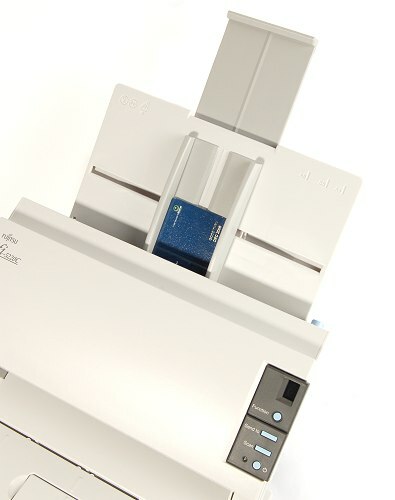 Working off user feedback of the older fi-4220C image scanner, the new fi-5220C (and the fi-5120C) now comes with ultrasonic multi-feed sensors that will automatically detect accidental feeding of multiple pages to ensure smooth, continuous scan of documents. It is also capable of mixed scanning where documents in a batch can now comprise of regular paper printouts, transparencies and even photographs, thereby allowing users to save time from having to sort out documents before scanning. Given the high 30 pages per minute (ppm) scanning speed, ensuring that all documents in batch are properly scanned is vital. 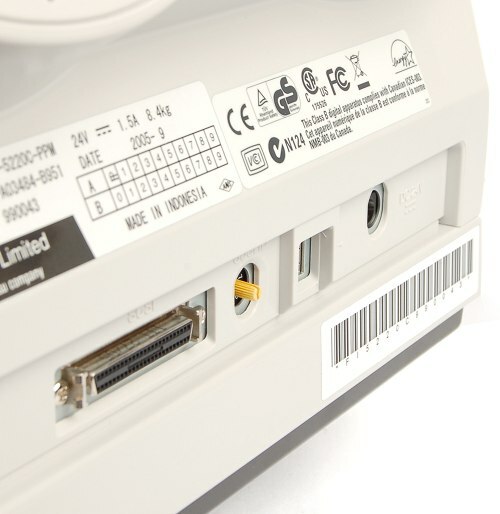 In addition to the usual variety of documents that automatic document feeders (ADF) accept, the version found on the fi-5220C can even scan embossed cards ranging from credit cards, driving licenses to identity cards, all without damaging the cards or the scanner itself. This is made possible by Fujitsu's 'Straight Paper Path' advanced technology, which means the old hassle way of using a flatbed to slavishly scan such cards is now a thing of the past. The ADF found on both the fi-5120C and fi-5220C is capable of performing monochrome, grayscale and color scans with resolutions ranging from 75dpi to true 600dpi optical resolutions and has a maximum paper load of 50 sheets. There is even the added flexibility of fine-tuning the resolution in 1dpi increments to facilitate greater control of image quality in relation to the file space needed for each output file. Obviously, the higher the scan resolution, the more processing time that is required to complete each individual/batch scanning session. At a resolution of 150dpi, single sided A4-sized scanning in portrait orientation can be performed at a speedy 30ppm pace while duplex scanning of A4-sized documents can be performed at 60 images per minute (ipm). Similarly, with the scan resolution increased to 200dpi, simplex and duplex scanning speeds for A4-sized portrait documents are slower but no less impressive at 25ppm and 50ipm respectively. 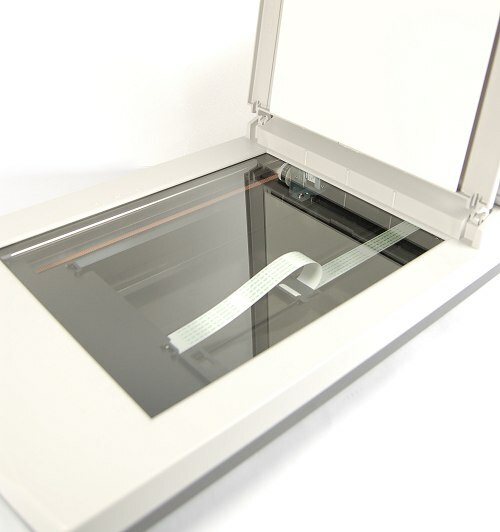 The addition of a flatbed scanner separates the fi-5220C from the fi-5120C, which like the ADF scanner, is also capable of scanning in monochrome, grayscale and color. However, since the image sensor has to travel along the length of the supporting rails to complete an A4 scan, the speed at which it is able to capture documents at 150dpi and 200dpi is at 1.7 seconds and 2.2 seconds respectively. 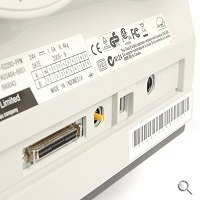 The installation process for such a serious looking workgroup scanner was surprisingly easy, requiring no more than the installation of the driver, the scanning software and hooking it up to either a notebook or a desktop computer. 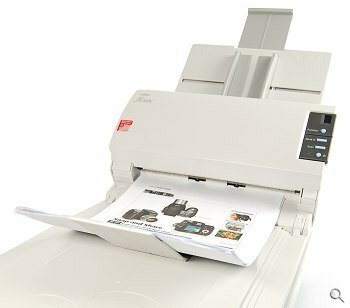 Although the majority of consumers will undoubtedly find the US$1,323 price tag attached to the Fujitsu fi-5220C to be somewhat steep for a scanner, it must be said that average consumers were never the intended audience. 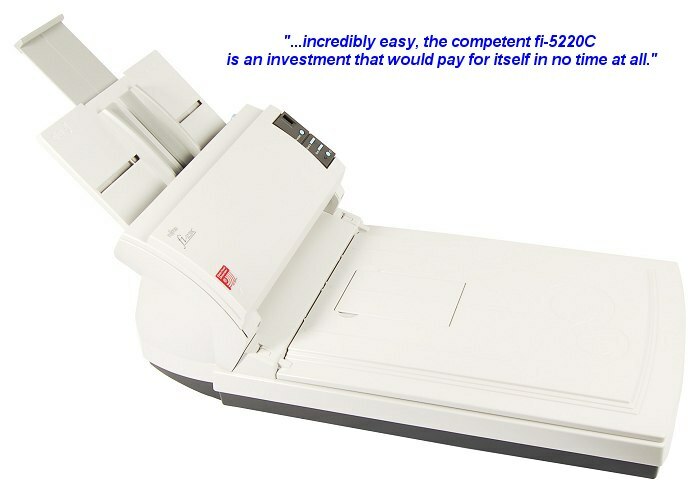 Targeted at medium businesses and enterprise corporations that frequently perform high volume paper document scanning for digital archiving, the competent and incredibly easy to use Fujitsu fi-5220C is an investment that would pay for itself in no time at all. Paper Chute Capacity: 50 A4 Sheets maximum.